Who is that girl I see? 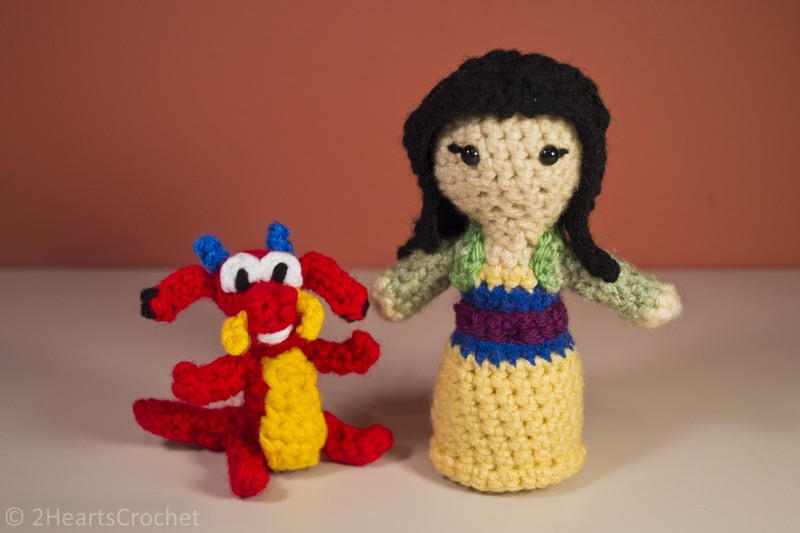 Why, it’s Mulan, of course! I am very excited about this pattern. 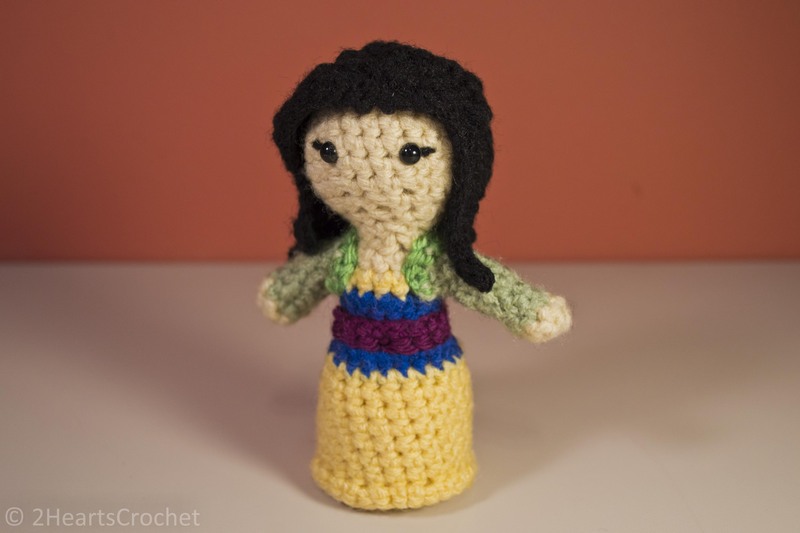 The colors are just great, and I love the way her hair turned out (nice and not-curly, thanks to blocking)! 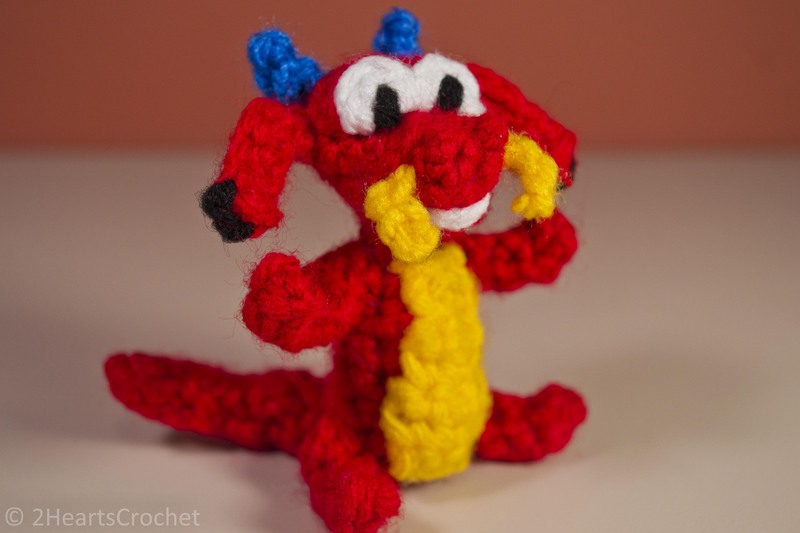 And as a special bonus, I managed to work up an awesome pattern for our favorite real dragon, Mushu! Rnd 13: Work 2 sc in each st around. Switch to light cornmeal, join and ch 1. Rnd 14: In cornmeal, work 1 sc in each of the first 4 sts, 2 sc in next st, 1 sc in each of the next 4 sts, 2 sc in next st, 1 sc each of the next 2 sts. Change to dark blue/navy, join & ch 1. Rnd 19: Work 1 sc in each st around. Change to cornmeal, join and ch 1. Rnd 20: In cornmeal, work 1 sc in each st around. Join and ch 1. Rnds 21-25: Work 1 sc in each st around. Join and ch 1. Rnd 2: sc around. Switch to pale green, join and ch 1. Rnd 1: In light green, ch 15. Work 1 sc in each ch space across. Ch 1 and turn. Rnd 2: Sc across. Change to green, ch 1 – do not turn. Rnd 3: In green, work 1 sc in the each st of the “side”, 1 sc in the corner, sc across, 1 sc, and 1 sc in each of st of the side. (Think of it as working along the short edge of a rectangle, the long edge, and the other short edge, leaving the bottom long edge untouched.) Fasten off, leaving a long tail. Sew the back dress detail onto the doll. Weave in ends. See photos for placement if necessary. Carefully sew the arms onto the back dress detail. Weave in ends. Rnd 1: In berry, ch 19. In 2nd ch space from hook, sc across. Join and fasten off, leaving a long tail. 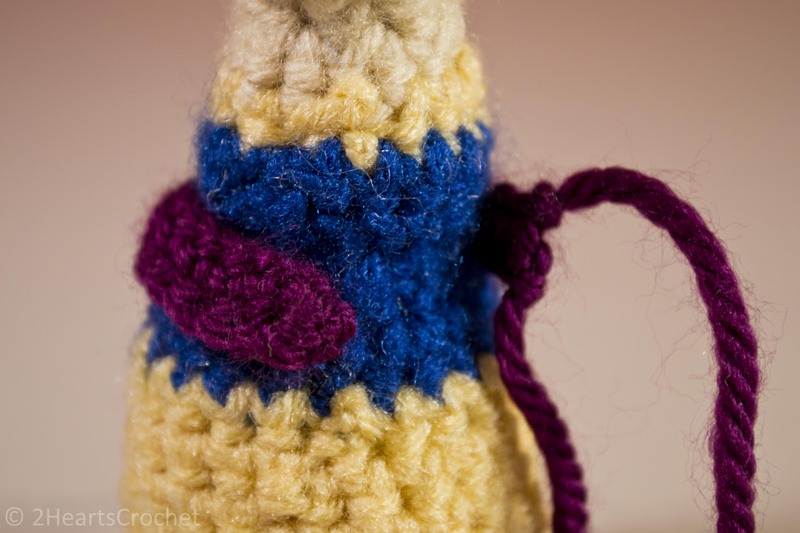 Using a tapestry needle and the tail ends of the yarn, sew the detail piece around the doll’s waist, joining the ends of the detail piece as a seam in the back. Weave in ends. 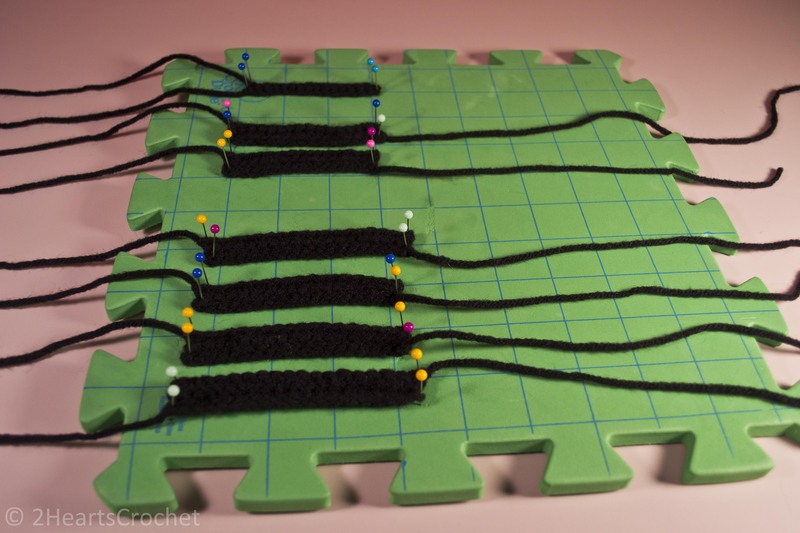 Hair pieces being blocked from top to bottom: 1 thin piece, 2 medium pieces, 4 long pieces (note: only 3 of the long pieces were used). Rnd 1: In black, ch 19. Starting in the 2nd chain space from hook, work 1 sc in each st across. Ch 1 and turn. Rnd 2: Work 1 sc in each st across. Join and fasten off, leaving a long tail. Rnd 1: In black, ch 15. Starting in the 2nd chain space from hook, work 1 sc in each st across. Ch 1 and turn. Rnd 1: In black, ch 15. Starting in the 2nd chain space from hook, work 1 sc in each st across. Fasten off, leaving a long tail. 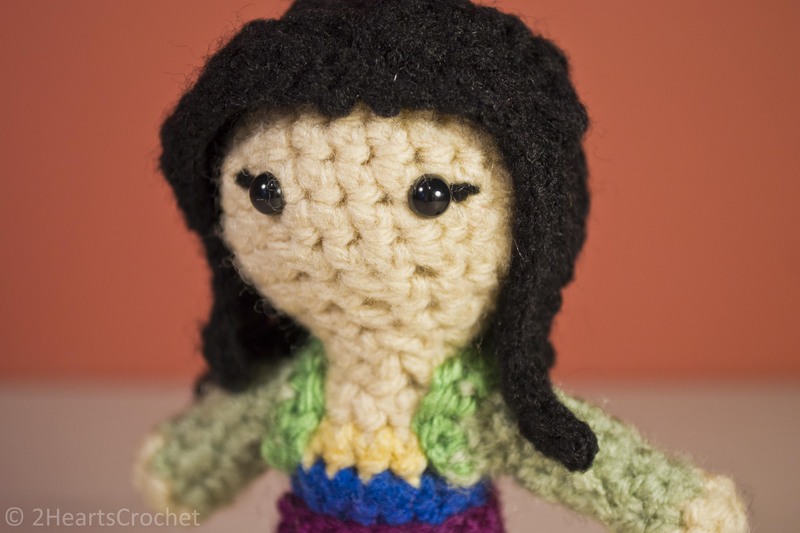 Using a tapestry needle and the long tails, sew the long pieces of hair onto the doll’s head first, slightly further back than center. See photos for placement reference if necessary. 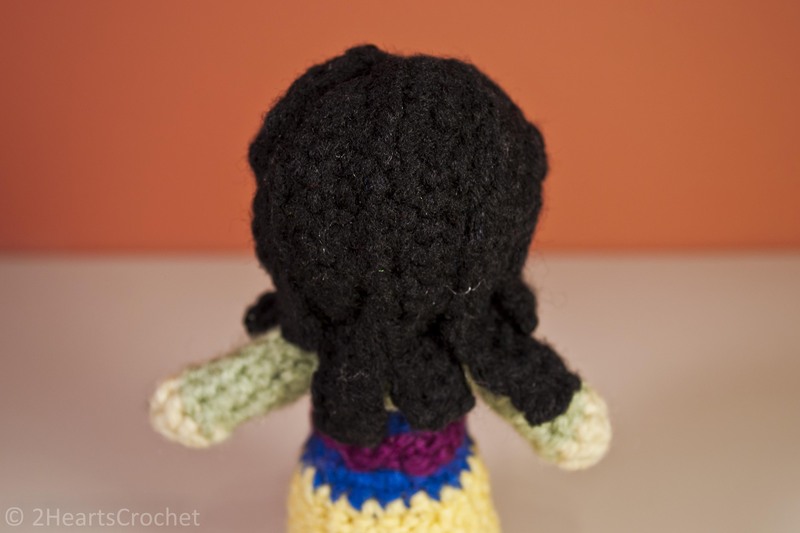 Place one long piece in the back center of the doll’s head slightly off-center and towards the doll’s left side and one long piece on either side of this center piece. Stitch the pieces onto the head by sewing along both long edges of the pieces (rather than just down the middle). Sew one medium piece slightly off-center on the doll’s left side. Sew this piece on by stitching along both long edges of the piece, like you did with the long hair pieces. 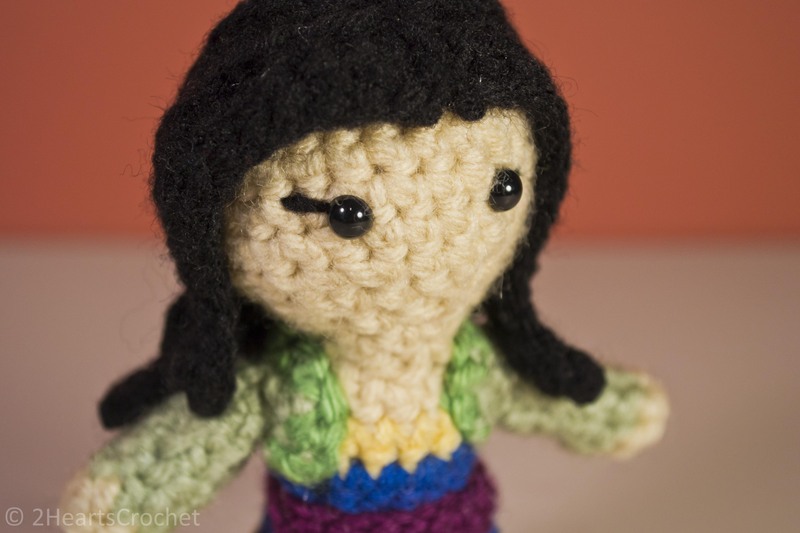 Sew the last medium piece onto the doll’s right side, but only stitch along the edge that is furthest from the face. This leaves the side of the piece that is furthest forward open. Stitch closed the gap at the crown of the doll’s head. This makes it so that only half the piece is sewn on, allowing you to shape the rest of it to be more like bangs. Using the same technique, sew the thin piece to the doll’s left side. See photos to get a better idea. Take a piece (about 6”) of 4-ply yarn and carefully split in half. The result is two strands of 2-ply yarn. Use a sewing needle to carefully make stitches on the outsides of the eyes. See photos to get a better idea. Rnd 1) In red, make a Magic Circle. Work 6 sc in the center of the circle. Join to the beginning of the round and ch 1. Rnds 2-3) Work 1 sc in each st around. Join and ch 1. Rnd 4) Work 3 sc in the first st, 3 sc in the second st, and then 1 sc in each of the remaining sts. Join to the beginning of the round and ch 1. Rnds 5-6) Work 1 sc in each st around. Join and ch 1. Rnd 7) *sc2tog* – repeat around. Join and ch 1. Rnd 8) *sc2tog* – repeat around. Join and fasten off, leaving a long tail. Rnd 1) In white, make a Magic Circle. Work 2 sc in the circle, join to the beginning of the round, and fasten off, leaving a long tail. 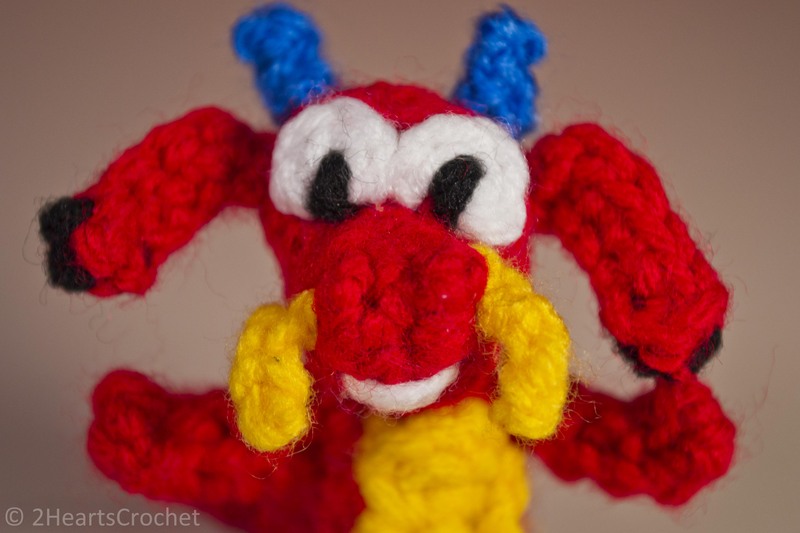 With a strand of black yarn, use a tapestry needle to stitch the pupils to the white parts of the eyes. Sew the eyes to the head. Weave in ends. Rnd 1) In white, ch 5. Work 3 sc in the second chain space from hook. Work 1 sc in each remaining st. Work a sl st in the last chain space and fasten off, leaving a long tail. With a long strand of black yarn, use a tapestry needle to carefully stitch a small black tip on the back sides of the ears. See photos for detail if necessary. Weave in ends. Sew ears to head. Weave in ends. Rnd 1) In blue, ch 4. Starting in the second chain space: sc, sc, dc. Fasten off, leaving a long tail. Use a tapestry needle and the tail end of the yarn to fold the triangular piece in half and stitch along the long sides, forming the triangle into a sort of cone shape. Sew to head and weave in ends. See photos for details if needed. 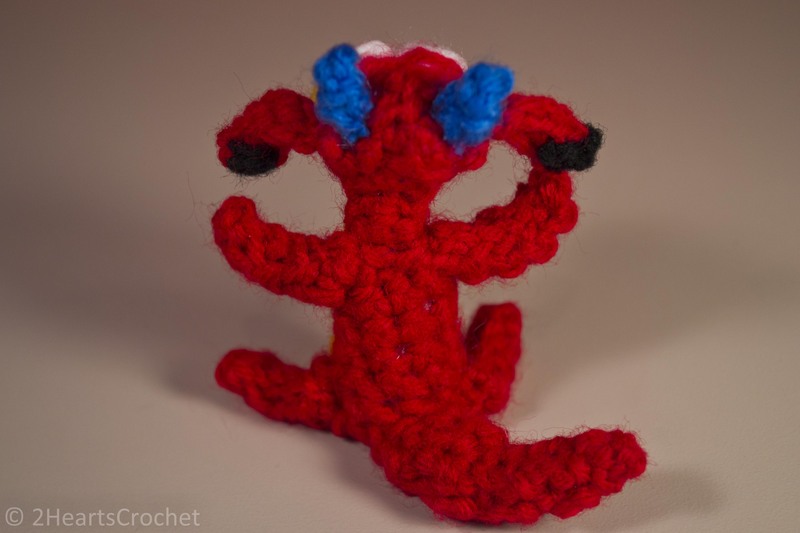 Take a strand of red yarn and make two square knots, one right over the other. Sew to head and weave in ends. Rnd 1) In yellow, ch 3. Fasten off, leaving a long tail. Sew to either side of the face. 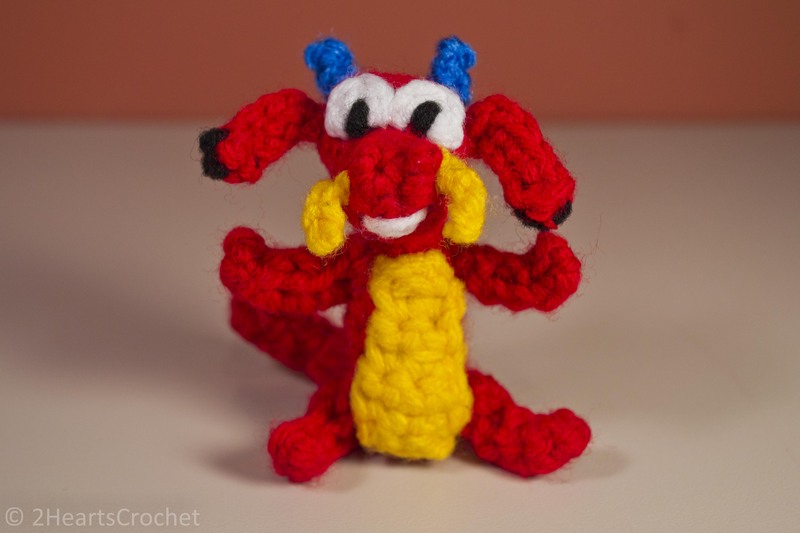 Using a strand of white yarn and a tapestry needle, carefully stitch on a small smile to Mushu’s face. Weave in ends. Rnd 1) In red, make a Magic Circle. Work 8 sc in the center of the circle, join to the beginning of the round and ch 1. Rnds 2-7) Work 1 sc in each st around. Join and ch 1. Rnd 8) *sc2tog* – repeat around. Join and ch 1. Rnd 9) Work 1 sc in each st around. Join and fasten off. Rnd 1) In yellow, ch 4. Starting in the second chain space from hook, work 1 sc in each st across. Ch 1 and turn. Rnds 2-3) Work 1 sc in each st across. Ch 1 and turn. Rnd 4) *sc2tog* – repeat around. Ch 1 and turn. Rnds 5-6) Work 1 sc in each st across. Ch 1 and turn. Rnd 7) sc2tog and fasten off, leaving a long tail. Using the tail end and a tapestry needle, sew the belly piece to the body, matching the narrow/tapered end of the belly piece to the narrow/tapered end of the body. Weave in ends. Rnd 1) In red, ch 6. Starting in the second chain space from hook, work 1 sc in each st across. Ch 1 and turn. Rnd 2) Work 1 sc in each st across. Ch 1 and turn. Rnd 3) Work 1 sc in each st across. Fasten off, leaving a long tail. Fold each leg piece in half, long edge to long edge. 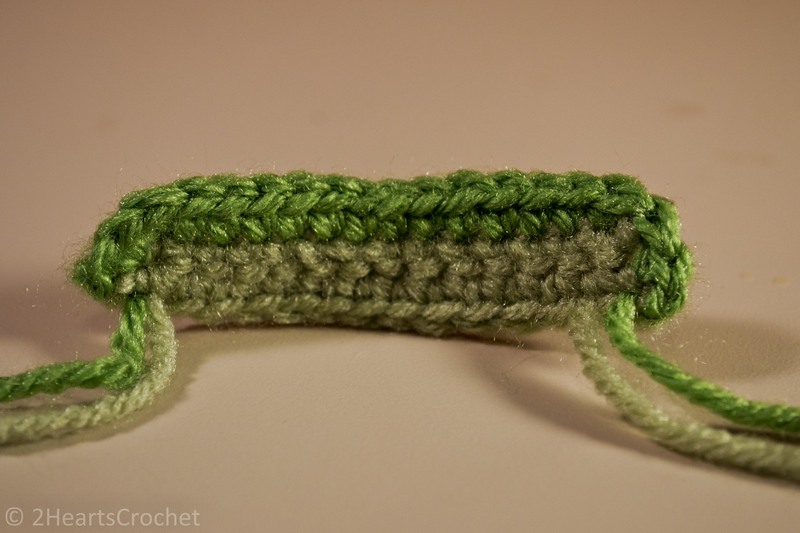 Use the tail end and a tapestry needle to sew the ends together, making a long narrow limb. Sew to the body and weave in ends. See photos for detail if necessary. Rnd 1) In red, ch 4. Starting in the second chain space from hook, work 1 sc in each st across. Ch 1 and turn. Rnd 2) sc2tog, sc in next st. Ch 1 and turn. Rnd 3) Work 1 sc in each st across. Ch 1 and turn. Rnd 4) sc2tog, ch 1 and turn. Rnds 5-7) Work 1 sc, ch 1 and turn. Rnd 8) sl st in remaining st and fasten off, leaving a long tail. Match the two tail pieces together and sew them together along the edges using a tapestry needle and the long yarn tails. Carefully sew to the body and weave in ends. See photos for detail if necessary. Now they’re ready to go out and save China! 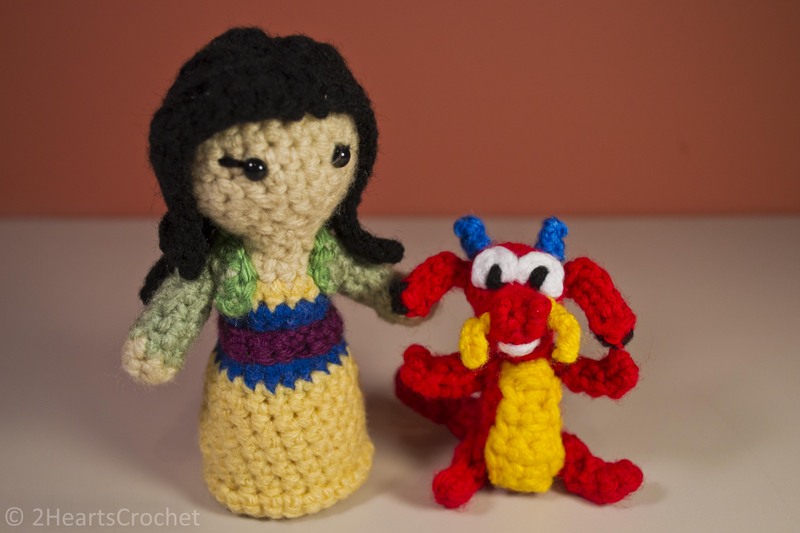 I really love the two of them together, and I especially love Mushu’s cute little face. He fits right in the palm of your hand! So what do you think? Let me hear you say “ah!” Leave a note in the comments! Next up, Tiana! Time to roll up my sleeves and get to work! Next postWinner of the April Giveaway Event and More!